What? We’re asian. We can say it. Booyah! Today, we called it girls’ day out, even though most of our ramen runs consist of only Tanya and I, (both girls). But, we did a lot of shopping and splurging on chocolate and came home for some champagne. You know, things girls do. If you were here at this moment, you would have noticed all the typo’s I just made. But you didn’t. Haha. 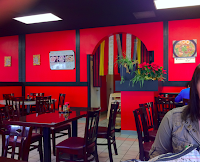 ANYWAY, we originally planned to check out Aji Man in San Gabriel. We found it listed in some Japanese magazine. But when we got there, the restaurant didn’t even exist anymore, so we decided to check out the next ramen house in the area. 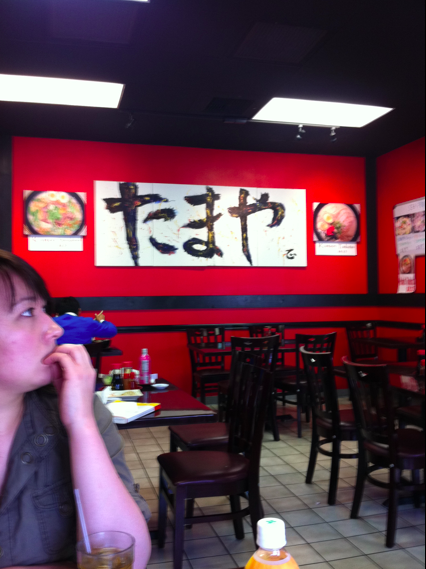 We found a place called Tamaya Ramen, in Alhambra, the next city over. The place is on the corner of Main street and Hidalgo avenue and they have a small parking lot of ten spaces right behind. Like my awesome photo illusion?? I ordered the tonkotsu ramen and Tanya ordered the shoyu ramen. I asked to have the bamboo removed. Cuz I remembered this time! (Usually I forget to and I don’t like bamboo!) 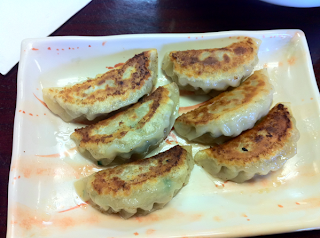 We also ordered the gyoza for appetizers. The gyozas, which actually arrived after our ramens, was pretty good. My tonkotsu ramen was not bad. It wasn’t super oily and not too salty. I actually did not feel swollen after eating the ramen. (I get like that with high sodium.) The only problem I had with it was the broth had a lot of onion flavor over the pork. Not because of the chopped green onions in the broth, but perhaps while making the broth, they put too much onions in it. I think they put too much pickled ginger in my bowl too, and I probably got the bottom of the jar because part of my broth was turning pink from the ginger’s juices. I was pretty bummed that I only had one slice of pork, but that one slice was very yummy, very tender and not too fatty. The egg was probably just a basic boiled egg. Overall, it was descent ramen. But I don’t think I would drive out of my way to have ramen there. If I just happen to be in the area, I wouldn’t mind stopping by if I was in the mood for ramen. Also, the whole time we were at the restaurant, the news was on and we saw updates on the recent Japan earthquakes and tsunami. Our hearts go out tothe people of Japan. Tanya here, well, I did like the place. 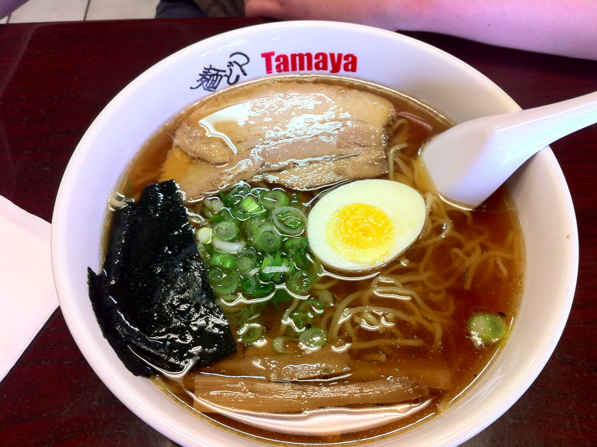 The broth was full of flavor and wasnt too too salty, a bit oily than I’d like but it didn’t sway me to a bad review. I was sad because the first gyoza fell to the floor efore the first bite because I was clumsy with my chopsticks that I decided to stab the other two I had left. Back to the ramen. I liked the slice of pork because the piece didn’t have too much fat in it. The noodles were nice and chewy and didn’t get soggy from me eating slowly. That’s about it from me. Overall, the price was very good. Tanya’s was $6.25 and my tonkotsu was $6.50. The size of the bowls were pretty large too. The service was fast, even though things arrived out of order. Also, the hot green tea I ordrered was free. Some places charge for hot tea. 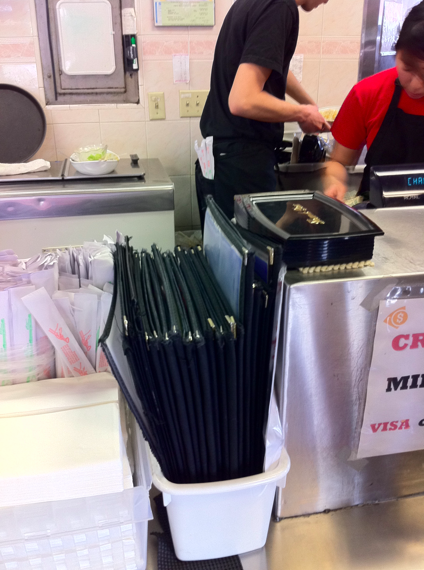 One thing that made me feel weird after I noticed, was our server kept all his chopsticks in his back pocket. I don’t think I would feel comfortable using chopsticks that was in someone’s back pocket. After our ramen run, we stopped by the Mitsuwa market down the street and splurged on Japanese chocolates, crackers, gum and fruit drinks. Tanya bought a strawberry soda that had a marble you had to push down to open the bottle. You should have seen this happen! She also bought some mystery flavored gum which was supposed to be “miracle” flavor, but that was the only word we understood on the label. I tried it and I seriously could not figure out what it tasted like. I picked up some pocky, something called Meltyblend (yummy!) and a yogurt strawberry drink. Then we decided to go shopping at the Santa Anita mall, about a few miles north of where we were. Today was a very fun and eventful day. I definitely needed a girls’ day out, it’s been a while. 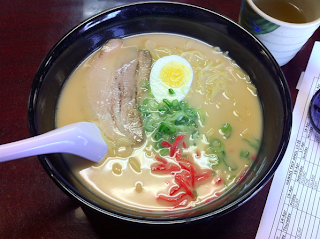 Thanks for reading and join us on our next ramen run!